October is Breast Cancer Awareness Month - Matlin Law Group, P.C. October is Breast Cancer Awareness month. All of us probably know somebody who has been affected by breast cancer. According to Cancer.org, breast cancer is one of the most common cancers among American women, next to skin cancer. Because of the huge efforts of breast cancer walks and campaigns, women today have more educational and diagnostic tools available to them than ever before. The odds of surviving breast cancer are strongly tied to how early it is found. Matlin & Associates genuinely cares for our clients and wanted to do our part to get the word out. 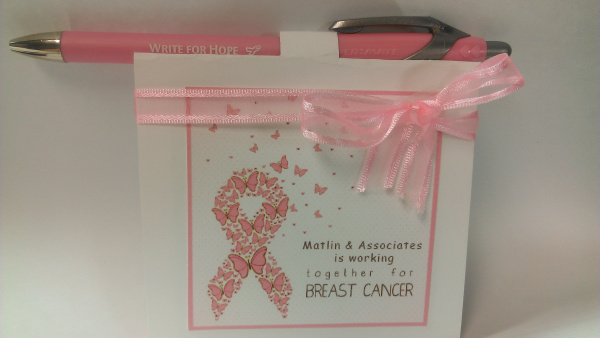 This month we made up pink Post-It ™ booklets containing pink pens and a message inside. Our hope is that each time our clients use these booklets, it will remind them to be educated and take the necessary steps available to them in order prevent or fight this disease.